MOMSPatterns Vintage Sewing Patterns - Butterick 3619 Discontinued 2002 Sewing Pattern Patriotic Nautical Flag Christmas Holiday Accessory Pack, Snowman Ornaments, Stockings, Garland, MORE! Butterick 3619 Discontinued 2002 Sewing Pattern Patriotic Nautical Flag Christmas Holiday Accessory Pack, Snowman Ornaments, Stockings, Garland, MORE! 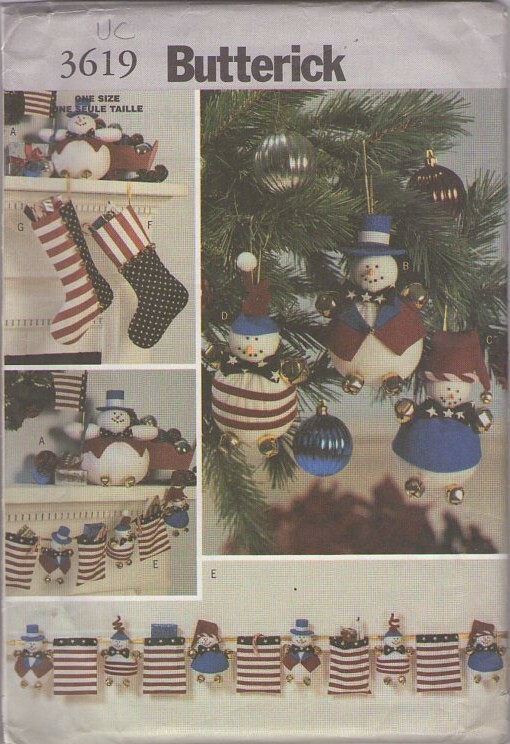 2002 Crafts, Retro Christmas Holiday Patterns - SNOWMAN CHRISTMAS ACCESSORIES. Package includes patterns and instructions for Centerpiece A: 9" x 11". Ornament B: 31/2' x 6". View A, B has contrast jacket, hat and bow tie. Ornament C, D: 31/2" x 5", excluding hat; contrast hat and bow tie. View C has contrast top. Garland F: 52' long, 31/2" x 5' snowmen and 4" x 51/2" bags. Stocking F, G: 17" L; contrast sections.